This airbrush piece has a metal flake with flip-flop top coat, which you can’t see in the photo but the paint is deep with dimension. The airbrush painting is also so detailed one can read the tiny names, John always wants perfection and detail. I bought this 61 Corvette in 2005 as a project. When I bought this Vet, it was all apart in boxes. In the process, I went from a mono radio to a stereo. I installed the new speakers in the kick panels. Now I needed to come up with something to put in the original hole in the dash. One day while looking at my other car, which has a POW/MIA plate on the front the idea came to me. I took another plate and cut it to fit into the original speaker frame. I received many positive compliments from fellow vets. 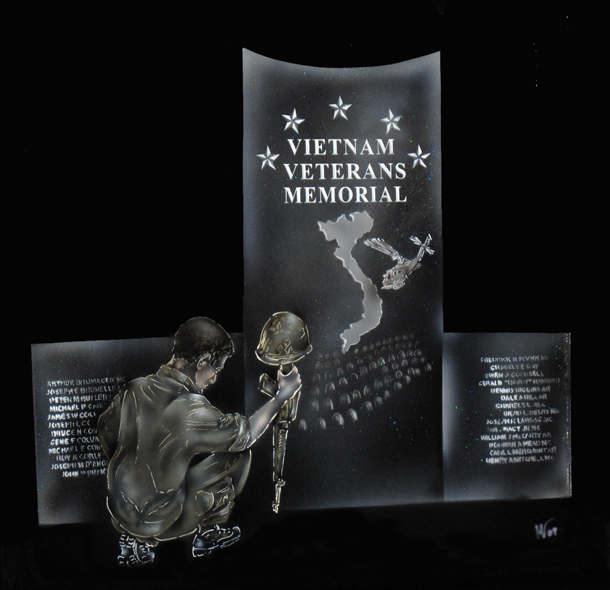 I contacted a local airbrush artist, Michelle Vara, from Wilton with my idea. She was very enthusiastic about it as you can see she did a fantastic job. I have brought the car to many shows since I completed her in 2008. There is still room on the lower panel inside the hood for a future addition. I served a tour in Vietnam in1967 with the U.S. Navy, was assigned to the Inshore Undersea Warfare Group 1, on a patrol boat, as a crew member.